I had signed up to the Hyperlinked Libraries MOOC a while back. I was only notified yesterday that there were over 1100 participants, and they have only space for 400. So I did not make it onto the course this time. I think there should have been a cut-off as soon as their limits were reached? 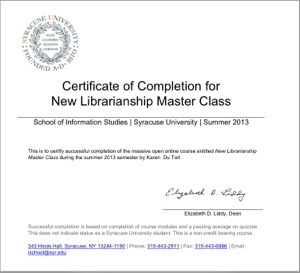 I also saw this MOOC being advocated through the International Librarians Network, and have signed up to David R Lankes New Librarianship Master Class through the iSchool at Syracuse University. Apparently there is still time to sign up. I struggled today to download my ebook version of The Atlas of New Librarianship, but finally managed to get it on my iPad! Just a quick note that I struggled a great deal today to purchase The Atlas of New Librarianship from MIT Press. I tried to make use of the discount code that you have supplied, but only after countless attempts and contacting Tech Support did they tell me it was only for the print version. That should have been stated from the start! Luckily the Tech Support gave me a 20% discount on the ebook as well. I nearly gave up out of shear frustration. I am planning to do this course on my iPad, because I still don’t have a computer at home! Truly mobile for ANZ 23 Mobile Things!